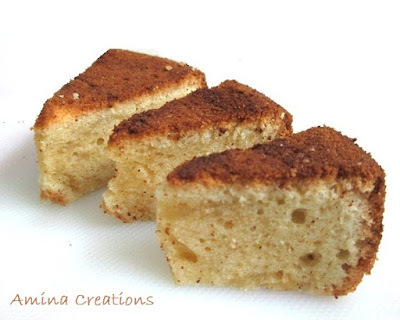 This is one awesome recipe of sponge cake that requires neither an oven nor the basic cup measurements. Here everything is easy, you need very few ingredients and your preparation time is reduced to just 5 minutes. So go ahead and try this out at home. I am sure this will be quick and delicious. Crack open 3 eggs in a bowl. Look at the quantity of the liquid in the bowl. If it fills 3/4th of the bowl, then all other ingredients such as sugar, all purpose flour and oil should be taken of the same quantity. Now add the eggs to a mixer jar. To the same bowl, add sugar and fill such that it occupies the same volume. In the same way, measure all purpose flour and oil as well and add all the 3 to the mixer jar containing the eggs. All these 4 ingredients should be of the same quantity. Now grease an aluminum cake pan with oil and pour the cake batter into it. Heat a thick bottomed pan (which is large enough to accommodate the aluminium cake pan) and place a ring over it. Close with a lid and heat for about 7 minutes so that the pan gets preheated. Now place the cake pan over the ring and again close with the lid. Place a weight over it and reduce the flame to medium. Cook for about 30 to 40 minutes or till you get a nice aroma of sponge cake. To check if the cake is cooked, carefully open the lid and insert a toothpick through the cake. If it comes out clean, your cake is cooked. Wait till the cake has come to room temperature and invert the cake over a plate. Cut it into pieces or decorate with frostings of your choice.